Having a short stint in Tokyo many years ago, I used to make myself a bowl of Ochazuke ( お茶漬け ) in my apartment in Kawasaki whenever I was pressed for time. 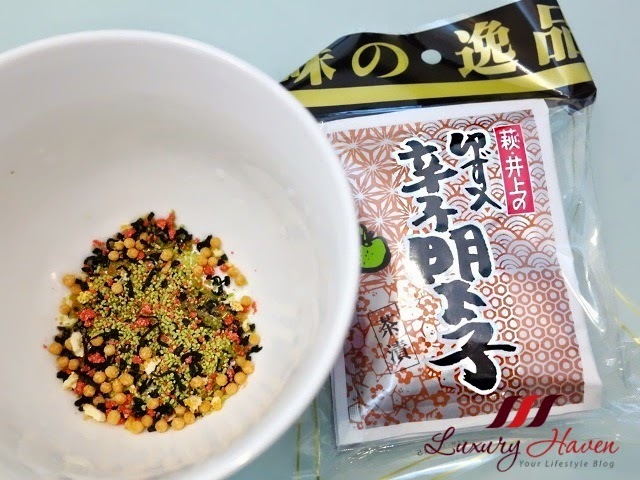 #Ochazuke is a simple Japanese dish made by just pouring green tea or hot water over leftover rice. 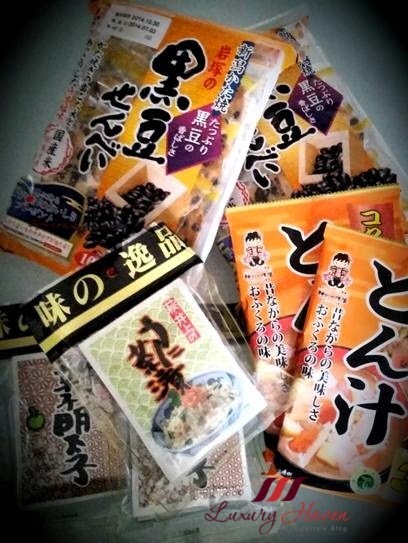 I received some souvenirs from my Japanese friend sometime back, and there were snacks, some packets of instant Ochazuke and soups! 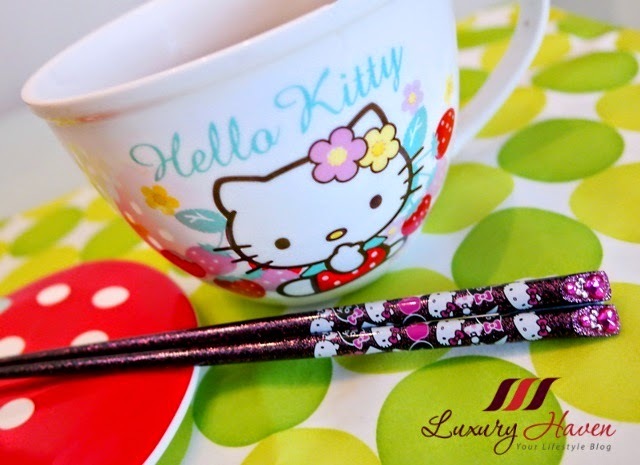 Wait, let me brag about my Hello Kitty bowl and chopsticks first before I introduce you to the food. Forgive me, but I can't help showing off my #hellokitty stuff. Lol! The pretty bowl was a gift from one of my students, and I bought quite a few pairs of the fanciful Hello Kitty Chopsticks from Japan. Lovely, aren't they? To make my Ochazuke breakfast, I opened up a packet of the Mentaiko ( pollock roe ) flavour, poured hot water over it, put in some leftover rice and added my favourite ingredients. 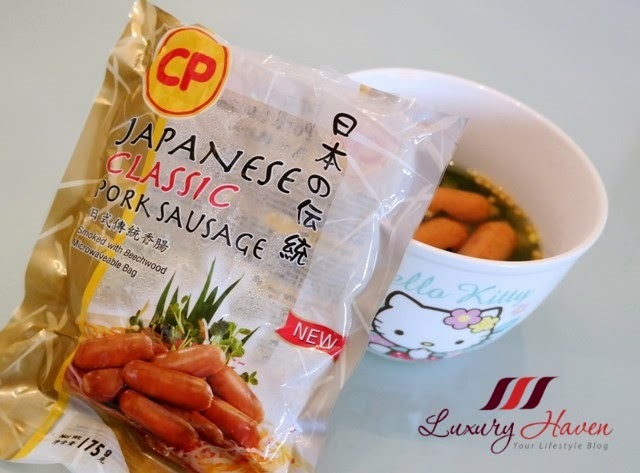 For those in Asia, have you tried CP Japanese Classic Pork Sausage (SGD 3.60)? My family loves their Japanese sausages for their crispy skin. 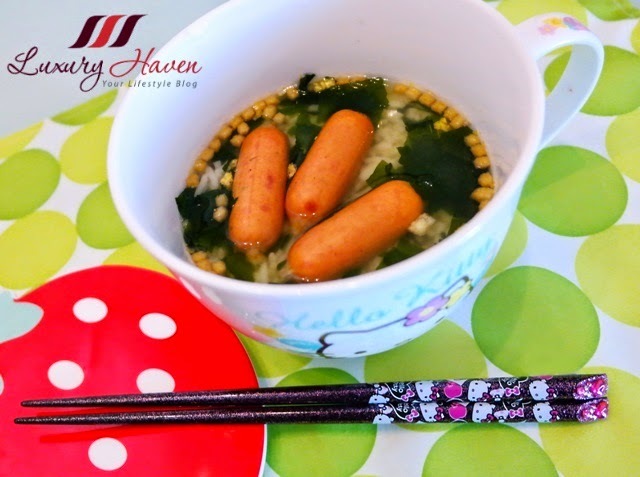 My Ochazuke breakfast was an enjoyable one, topped with #CPFoods sausages and served in my Hello Kitty Bowl! Join me?? never had any sausage ochazuke before, great idea! Dedy, it's definitely good to go! Bisma, glad you like it too! Carmen, so glad to have another Hello Kitty fan here! Of course, I am there with you Shirley. Beautiful bowl and chopsticks. Is so adoborable puts a smile in any one face. Ken, there are lots of Hello Kitty guys fans out there too, you know?? Hahaha! Emi, it's great having you around! This looks like so convenient but delicious! DS, it's totally fuss-free! Great for the busy executives. Rae, hahaha! Do we have another Hello Kitty fan here?? So cute!!! And looks like an easy dish to doctor up! YUM! Liz, care to join me?? Hahaha! Anja, thanks & have a good week! Such an amazing kitchenware! Have an awesome day. Kenny, glad you like it too! I like to eat Japanese food and I had ochazuke when I was in Japan travelling. Very tasty! Yours look tasty too! Mun, I'll be off to Tokyo next Monday! Can't wait to have Ochazuke for breakfast! That is one cute bowl. Kashaya, certainly one of my favourites! Dania, so glad to have another kitty fan here! Gosh! That's a lovely Hello Kitty bowl. My girlfriend would have love it! Billy, that's nice to know! Enjoy your coming weekend! OOoh, What a yummy and simple meal! I totally love your hello kitty things! I totally would buy that pair of chopsticks! I love soupy rice and those sausages look so delicious! Sharlynn, really looking fwd to my Tokyo shopping next week! Hahaha! I want this bowl!! So cute. In love with your bowl and chopsticks! Never try this breakfast before. Rose, it's easy to get it at the Japanese supermarkets. Nicole, I'm enjoying every bit of it! Such a super cute bowl. We are never to old for hello kitty items. Amy, definitely! Can't wait to shop for more! I so need that hello kitty bowl for my niece. Visit my blog for a chance to win a pair of Jeremy Tarian sunglasses for yourself and a friend. yum..yum...with your fav Hello Kitty hehe.. will get CP Japanese Classic Pork Sausage for family to try. Adelina, I wouldn't mind another bowl right now! wa you are such a big fan of hello Kitty. Rmb seeing your photo of your room with all the hello kitty items. Now even kitchenware!